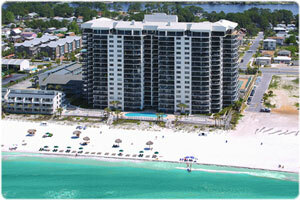 Pelican Walk Condominiums are among the most spacious condos in Panama City Beach. With large open floor plans and gulf front balconies, this 10 story condominium provides all the comforts of home while offering you the resort style living you have been looking for. There are two pools, tennis courts, a game room, and on-site security, just to name a few of the wonderful amenities you can look forward to. The full length windows and spacious balconies bring the beautiful views of the Gulf of Mexico into your condo making it a perfect home away from home. Pelican Walk condominiums in Panama City Beach has a large variety of floor plans to choose from. Each condo features full length windows, a fully equipped kitchen, and a spacious gulf front balcony. There are two pools, one which is heated year round, tennis courts, a recreation room, fully equipped kitchens and on-site security. With all of these amenities, it is easy to see why Pelican Walk will make the perfect home. Pelican Walk Condominiums are located on the eastern side of Panama City Beach on Thomas Drive. Within walking distance to local restaurants, it is also just minutes away from shopping, fishing, and tons of family activities. Created on 27 March 2012 .